Powers/Abilities: The Man of Iron armor was controlled by pulleys, prisms and mirrors. It could fit a normal-sized human inside, accessed via a hatch on the front, and required a little skill to operate. It stood about 8' tall leaving the person's head free from injury as the helmet actually sat above the driver. 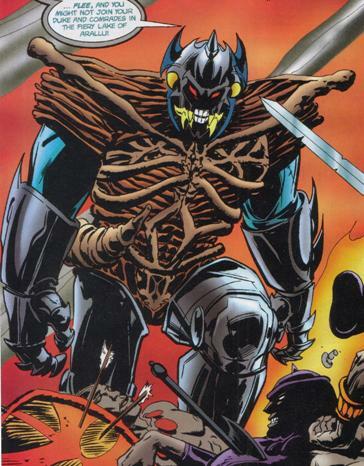 It was crafted from solid iron and decorated with what appeared to be bone plus a black intimidating helmet that had red eyes (possibly colored glass or painted). It was formidably protective for the era with all hand weapons failing to penetrate it and shattering swords. Although Rowena asserted that it was made from science, the Shield-Maidens stated it was forged in a magic pyre, although this latter statement seems to be embroidered. When Rowena wore the armor, she used a tritone horn to signal the castle. The weapons used with it included a Hyrkanian steel sword and a Nemedian iron ax that was holstered on the back of the armor. Despite its size and apparent bulk, it could still be carried around by a horse. It also seemed to mask the voice of the wearer so that it sounded more terrifying. (Conan II#7 (fb) - BTS) - Wu, the savant of Paikang in Khita, crafted two suits of formidable armor that were worked through scientific means of pulleys and levers. He presented one suit to the Great Khan but was instead sealed up in the armor and cast into a furnace. Wu's son brought the secret second suit to Rowena and he was handsomely rewarded. Rowena then sought to fashion more suits of armor and wanted a general to lead her armored soldiers but used it in the meantime to protect her castle. (Conan II#7) - Conan was employed by an unnamed Duke as a mercenary to attack some freeholders. The battle between the two forces was bloody and left only Conan and the Man of Iron standing. The two warriors clashed with Conan succeeding in severing the helmet from the armor. However, the Man of Iron picked up its helmet and placed it back on its shoulders before knocking out the incredulous Conan with the flat of its ax blade. Rowena, the wearer of the armor, saw Conan's potential as a future general of her armored army and signaled the nearby castle so that the Shield-Maidens could carry the mighty Cimmerian back. The next day, Conan was woken from rest by the horn of the Man of Iron, which had engaged attacking brigands in fierce battle, slaughtering them all. The Man of Iron then rode back inside the castle and reveled in the bloody victory before her brother Ragallo and Conan atop the castle's walls. Overcoming the stuck latch, Rowena emerged from the armor and told Conan of its history and her plans for future conquest. However, she was killed by an arrow in the back fired by Ragallo who promptly retreated inside the Man of Iron armor and succeeded in killing the attacking Shield-Maidens. Conan once more fought the Man of Iron Man. Despite his lack of skill, Ragallo was still able to hold Conan at bay. However, Ragallo's inexperience resulted in a lunge at Conan that carried the both of them over the parapet and into the moat below. Seeking to escape the water rising inside the armor, Ragallo was unable to open the latch and drowned. Comments: Created by Larry Hama (writer) and Bret Blevins (pencils and inks). The cover cites "Conan vs. Man of Iron", with Man of Iron in the same style of logo as for Iron Man (circa 1990) but without the bolts. The cover shows the Man of Iron wielding blue fire from the left armored glove but this is not shown in the actual story. Ragallo was brother to Rowena and master of the protected castle. The Shield-Maidens considered him too weak and craven to manipulate the Man of Iron armor. He fired arrows from the battlements while his sister fought the brigands attacking the castle. Ragallo was unpracticed in the workings of the armor but was still able to brutally slay the Shield-Maidens when they ran to protect Rowena. Despite his evident strength when firing arrows, he was unable to release the armor's latch to escape after the armor had fallen into the moat with him inside and so he drowned. 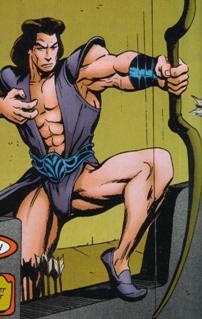 He was a skilled archer but had no qualms about killing his sister as he craved their family's wealth. Rowena was the prime user of the Man of Iron armor and was extremely skilled in brutal hand-to-hand combat. She was studying the Man of Iron armor, which had been given to her by the son of its creator, so that it could be replicated to form an army of invincible warriors. She wanted Conan to be the general of this iron army. Rowena also commanded the Shield-Maidens to carry Conan from the battlefield where they first fought. She was fearless and was apparently able to bend men's wills with her charms. However, she was slain by her brother with an arrow through the back. The Shield-Maidens comprised four lithe young women under the command of Ragallo and Rowena although they seemed primarily loyal to Rowena. They carried the fallen Conan from the bloody battlefield and greeted him with food and wine plus other pleasures of the flesh. They ran to Rowena's aid when she was attacked by her brother but were all slain by Ragallo after he had gained control of the Man of Iron armor. The Shield-Maidens were armed with a sword and shield each, but had extremely minimal armor (reminiscent of Red Sonja) and winged helmets. They were initially shown with different colored hair, but later went all blond and appeared very similar to each other. Only one was named: Isolde.